Have you heard of Tzatziki? 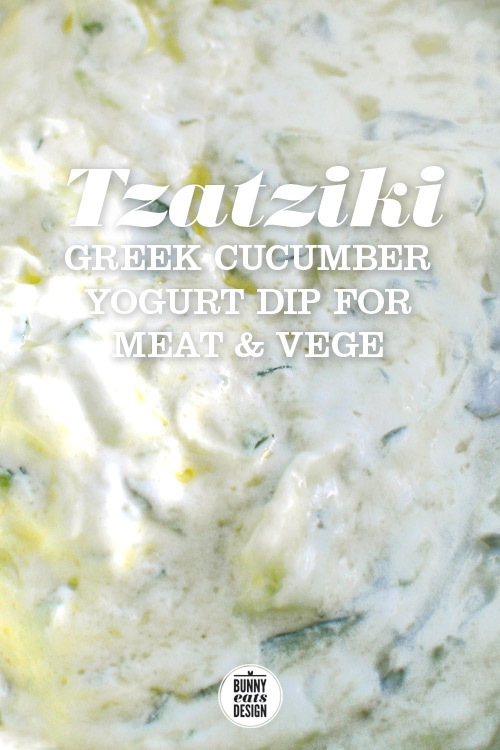 Tzatziki is a thick yogurt and cucumber dip that works with range of dishes. It’s cooling and lovely and surprisingly easy to make. Tzatziki has been on my foodie bucket list for a long time. I put it on there because The Koala was obsessed with Delisio Greek Tzatziki flavoured chips. He’s since moved on but the Tzatziki remained on my list. Had I known how easy and versatile it was to make, I probably wouldn’t have waited all these years. 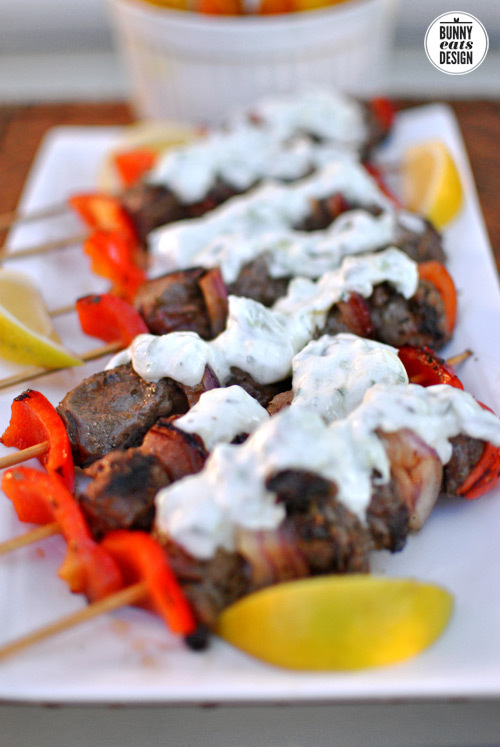 Below is a recipe for Tzatziki and a bonus 2 recipes that complement it. Recipe adapted from Nici Wicke’s recipe here. Mix all ingredients in a bowl. Taste and adjust seasoning to your liking. Chill prior to use and stir before serving. Use as a dipping sauce, a side or spoon on top of meat or fish. *Greek yogurt is strained plain yogurt. You can strain it yourself if you do not have access to Greek yogurt. This next recipe is very basic and can easily be double or tripled for more people or larger appetites. I used potatoes and carrots because they’re cheap and happened to be all we had, but you could use pumpkin, kumara (sweet potato) or parsnips. For this recipe, you’ll need a clean plastic bag, make sure it doesn’t have any holes in it by filling it with air and twisting the end shut. If it doesn’t trap air tightly, find another bag. Peel vegetables and cut into fat chips or wedges. Try and keep the thickness of the chips as even as possible so they cook evenly. Strip the rosemary and discard the stem. Place vegetables into the plastic bag with the rosemary leaves, turmeric, olive oil and salt and pepper. Twist close the opening and give the bag a good shake, distributing the seasonings through the bag. Empty bag onto a baking sheet and bake for 40 minutes, turning once. Serve with a large dollop of tzatziki or sour cream. I buy rump steak because it’s economical and tender enough to cook quickly and eat as steak. Please note that in North America, this cut comes from the same area as where you might find “Sirloin”, “Tenderloin”, “Top Sirloin”, or “Bottom Sirloin”. Aged properly, rump is tender and full of flavour. Soak bamboo skewers in water while you prepare the rest of the ingredients. Cut steak into 1 inch cubes, put into a bowl and lemon juice, oregano and garlic powder. Mix and set aside. Wash the capsicum, cut in half, remove and discard the stem and seeds. Cut in to bite sized pieces. Peel onion and cut into bite sized pieces. Thread steak, capsicum and onion onto the skewers, alternating however you wish. Heat oil in a heavy pan or barbecue grill. Cook skewers for 10-15 minutes, rotating to ensure even cooking. Season with salt and pepper and serve on a platter with lemon wedges and tzatziki. This post is part of Our Growing Edge, a monthly blogging event to encourage us to try new food related things. Eva from Kitchen Inspirations is the host for this month’s event. If you have a blog and you are eating or cooking something new this month, click below to join. I love what you’ve done here. 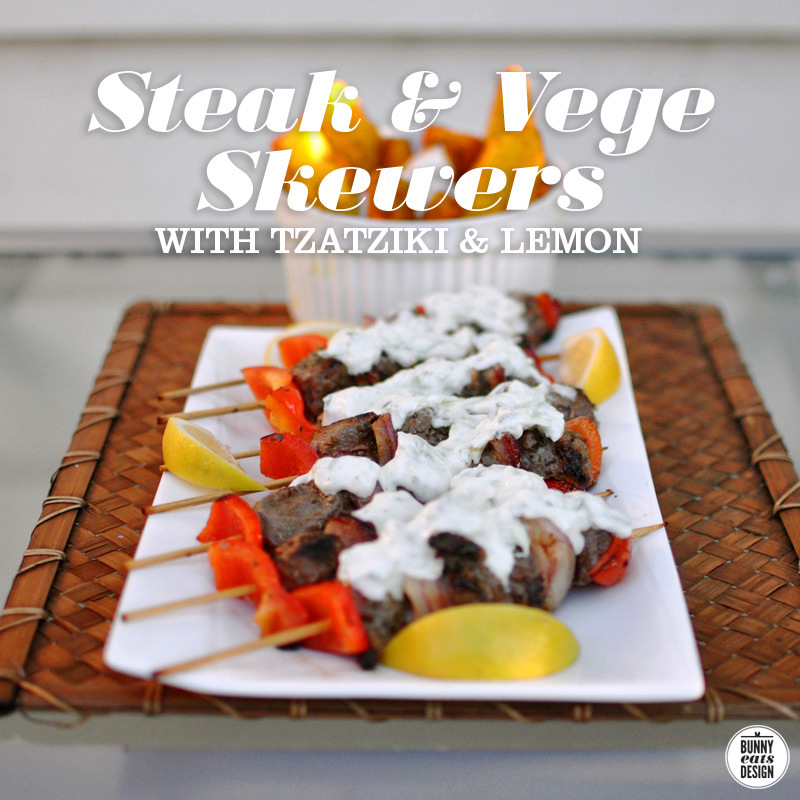 I effing love Tzatziki and we do it almost exactly the same… And the skewers and the chips are bang on. It all just sounds effing cracking. Thank you. I like to think this spread would translate very well to an Aussie backyard with a beer or wine in hand. You damn well know it sister! 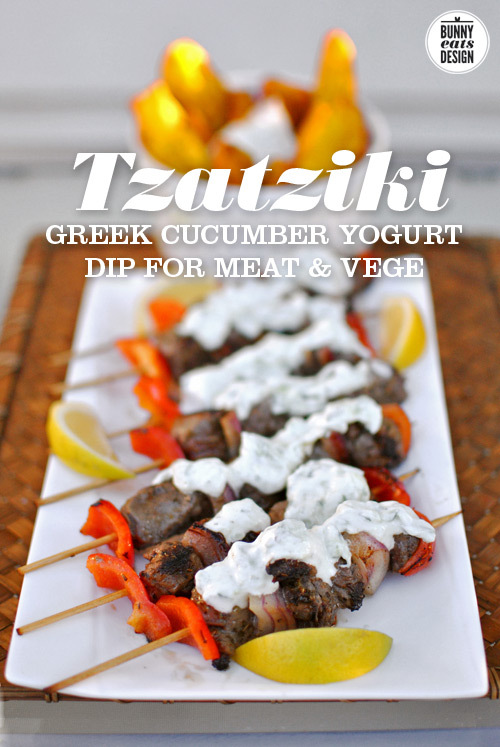 I love making tzatziki, it’s a staple during BBQ season. I purchased a reusable coffee filter to strain yogurt in, it’s a lot finer than a sieve. Never thought about a coffee filter. Have to try that. Thanks. Love this and it IS effing easy to make. I love mine as a dollop on spicy East Indian and Mediterranean dishes. Yes, that makes sense, this dip actually reminds me a lot of the Indian “raita”. Oh, I love the addition of cumin, especially if using tazatziki with lamb. Lots of inspiration for tonight’ s supper. 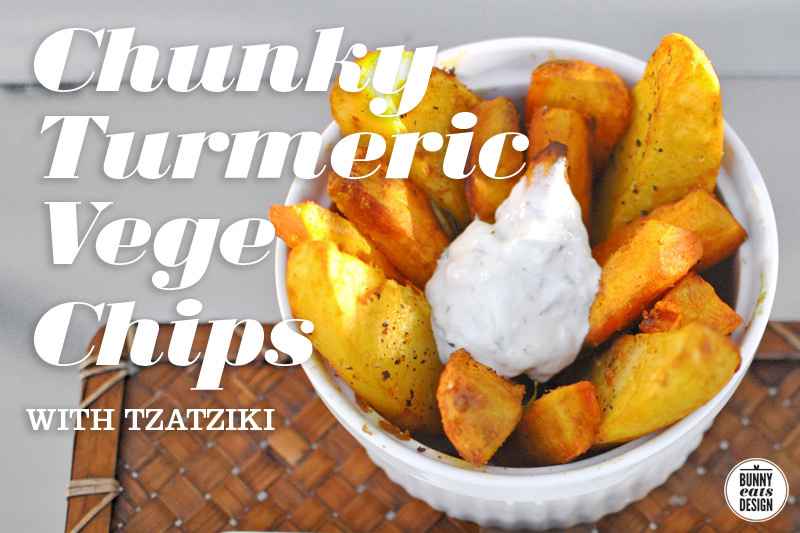 Love those turmeric chips. 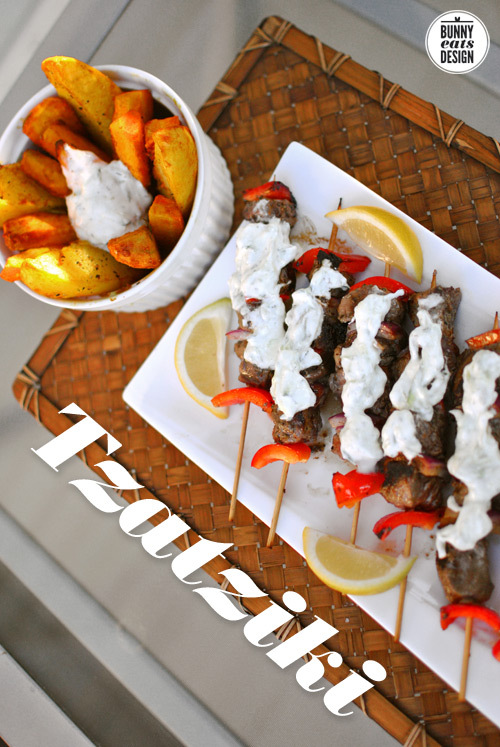 I love tzaziki, I put it on fish, chicken and beef. I don’t have a good recipe, so I will give yours a try! I definitely need to add this to my cooking to-do list! It looks perfect for grilled meats in the summer time! !